Government of Gujarat plans to develop Dholera Airport as a MRO hub, incorporating all the capabilities, facilities and warehouses in the Airport to provide low-cost, high-quality services to aircraft and parts manufacturers as well as airlines and other companies in the industry. The Gujarat government plans to develop land close to proposed Dholera International Airport airport for MRO and Aviation related other facilities. The strategic location of Dholera airport, serves additional advantage for becoming the Global MRO hub as well as hub for aircraft part manufacturing. This MRO hub will be backed by the level of economic activities in the DSIR and enormous domestic and foreign investment in the region over the years. Air transport MRO business in the world was estimated at $40.8 bn in 2006. The Asia-Pacific aircraft and engine MRO market totalled $ 8.71 billion in 2005 and is estimated to touch $12.90 billion in 2011. North America is the largest MRO market of the world, accounting for around 40% of the world market. Western and Eastern Europe drive 28% of spending. Asia Pacific, China and India combined represent 22% of the market share. However India alone represents only 1% market share of the global MRO business. The industry used to earlier operate as a captive maintenance provider earlier. However it is now gradually moving towards a total solution provider that includes a variety of maintenance and repair services. In fact airlines have started showing a preference for comprehensive solutions that include scheduled heavy maintenance and engine checks over a fixed number of years, ranging between 2 and 10 years. The changing trend in MRO is captured in the following exhibit. The growing complexity of airframes, systems, engines, and related components is leading to increased inspection and maintenance time, leading to a higher demand for MROs. Besides Tighter Safety regulation by Civil Aviation Authorities (CAA) in most regions leading to a situation where regular upgrades of different aircraft components are becoming essential. MRO providers prefer long-term maintenance agreements for engine repairs, allowing organizations to offload activities that are not compatible with standard operations. Passenger growth and fleet size growth are important factors contributing to the MRO industry. The combined fleet of India and China are projected to reach 3000, almost three times existing size by 2016 . As a result of this growth in fleet size, the Chinese and Indian MRO market is likely to touch $3.8B and $ 1 bn resp, growing at 9.5% and 10% respectively. In terms of their geographical spread, MRO service providers in Asia Pacific are concentrated in China, Singapore, Malaysia, and Dubai. Simultaneously, both Dubai and Abu Dhabi Governments have developed MRO hubs. Singapore is considered the world’s leading MRO centre enjoying 3% of global market share and 25% of Asian market share. More than 100 leading international MRO companies operate from Singapore. In 2005, Singapore Aviation industry recorded an output of USD 3.2 billion, out of which 90% came from MRO services. Further, Singapore is home to original equipment manufacturers (OEMs) of the United States, United Kingdom and France who operate either individually or in joint ventures with local companies. OEMs are the key to development of MRO market. Favourable policies, strong distribution and technological network of OEM players, development and availability of skilled manpower and its position as a centre for trade has contributed in the development of MRO industry in Singapore. China, with its 300 MRO companies, generated USD 1.3 billion from MRO business in 2006. China offers tax breaks, better infrastructure, cheaper labour and a bigger market. Further, China's fleet of commercial schedule aircraft stands at 1,060 which is three times India's fleet of 380. According to a forecast by Airbus, China will have 3,238 aircraft by 2026 as against India's 986, reflecting the larger market in China. The Indian MRO market is estimated at $800 million and is growing at about 8% annually against a 4% world average . A recent Ernst &Young study has stated that Indian MRO market is expected to grow at an average annual rate of 15 per cent. The Indian MRO industry is relatively underdeveloped, but is experiencing rapid expansion. Presently there are few parties that provide comprehensive third party MRO services in India. The market infect comprises of not more than five key players operating at Mumbai and Hyderabad. These players are as under. Air Works Mumbai (Additional small facilities at Delhi, Jaipur, Ahmedabad, Chennai, Pune, Hubli, Coimbatur and Hyderabad) Engine, Line maintenance, Heavy maintenance and Defence MRO It provides services like Maintenance of Airframe, line maintenance, component maintenance and level of engine maintenance. Air India Express, Reliance, Birla, Essar. HAMCO (Hyderabad Aircraft Maintenance Company) Hyderabad Presently line and component maintenance. Also planning for develop one stop MRO providing each and every MRO facility. Avionics, electrical and airframe services, simulation and manufacturing services. Developing Aero Zone in Hyderabad which would provide one stop MRO services. This area would be spread across 250 acres. HAL Bangalore Line and engine maintenance Overhaul and repair services relating to engine segment. Indian Air force, Pavan Hans etc. Indian aviation sector is set for significant growth in MRO appetite, driven by growth in domestic traffic and fleet size. During the period of the 11th Five Year Plan period, passenger traffic is expected to increase by about 19% and cargo traffic by about 11%. 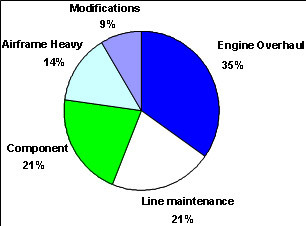 MROs in India currently provide only primary level of services. For instance, Max aerospace is the biggest MRO in India but will not provide advanced overhauls and services. Commercial airlines use either Dubai or UK for secondary and tertiary level services. To meet the demand in advanced services, several domestic and overseas aviation players are entering MRO industry. The following Exhibit attempts to capture the status in this regard. Jet Airways Bangalore Maintenance and engineering facility Jet Airways has signed a land-leasing and framework agreement with Bangalore International Airport Limited (BIAL) to set up MRO at BIAL. Lufthansa-Technical of Germany with GMR group Hyderabad Signed agreement to set up MRO at Rajiv Gandhi international Airport. Thales International Gurgaon Thales International, the aerospace, defence and security major, has tentatively planned to build an avionics maintenance centre in Gurgaon, Haryana. Sabena technics of TAT Group, France Hosur (Tamilnadu) Manufacturing of components and maintenance Sabena technics has signed agreement with TAAL to develop an MRO at TAAL's airfield in Hosur. Airbus Nashik Tie-up with Hindustan Aeronautics (HAL), for setting up a US$ 100 million MRO facility. Also signed MOUs with Maharashtra Airport Development Company. SIA engineering of Singapore with Wadia group Location is yet to be decided. Signed a MOU for setting up MROs in India. HAL and Pratt and Whitney Canada (P&WC) Bangalore Engine maintenance Engine Overhaul and maintenance services. This MRO would have yearly capacity of 150 aircraft. Air works Hosur Engine and heavy maintenance Setting up commercial MRO with 5 hanger capacity providing line, heavy and engine maintenance services. Further to the above, there are unconfirmed reports that firms such as Timco Aviation Services of USA, Singapore Airlines, Singapore Technologies Aerospace, the Israeli national airline, and engine makers like Snecma, Rolls Royce, GE are planning to establish their base at India. Given the large number of potential entrants to the Indian MRO industry, it would be relevant to assess whether there is a supporting demand. One may assess a few pointers. The Indian civil aviation sector has around 400 aircraft on order. While the current slowdown may lead to cancellations, the underlying market potential is huge, (if only very price elastic). India at present has 327 commercial schedule aircraft. However the Centre for Asia Pacific Aviation (CAPA) has predicted that India has the potential to service a fleet of 1,000 commercial planes and 500 general aviation aircraft by 2020, including replacement of current fleet. Such large expansion will also drive growth in MRO activity. It is considered more cost effective to have these facilities within the country rather than outside for cost saving. The LCC airlines are extremely sensitive to cost and domestic MRO services are likely to benefit from them. Another factor that could drive MRO business in India is availability of low cost manpower. As per a recent E&Y study, Indian MRO industry’s greatest advantage is low manpower costs (20 per cent lesser costlier than Asia-Pacific region and nearly 50 per cent lesser than that in the US). The MRO facilities will foster creation of ancillary and associated industries and services like training institutes, component repair and testing of avionics equipment, electrical and electronic system components, hydro mechanical and pneumatic system components repair of composite structures, passenger seat repair, cabin panel repair, etc. This is leading to an increasingly favourable policy stance of the Government towards MRO. For instance, the government is now allowing 100% foreign direct investment in the MRO sector. This could lead the segment to witness a higher FDI. Overall, recent estimates have put the potential of Indian MRO industry at US$ 30 billion by 2020. It is important to know the opportunities for MRO industry in Gujarat in view of the high demand and impeding supply. Several factors have implications for such opportunity in Gujarat To aid MRO viability, firms need to establish themselves near established airports. This greatly enhances their business opportunities. However busy airports like Mumbai are already congested and have little space left for functions like MRO. This could drive this business to other airports. MRO activity in Gujarat can find opportunities if it is near busy international airports, where there is supporting presence of industries and plenty of land/space availability. Under these criteria, any location in South Gujarat would be benefited by proximity to two international and busy airports namely Ahmedabad and Mumbai international airports. PCPIR region situated at Dahej is a rapidly growing industrial region and exhibits potential to host MRO services for aircraft as large tracts of land could become available under PCPIR development. The place is strategically located and can serve Vadodara, Surat, Mumbai, Ahmedabad and Indore airports. Secondly Dahej, being located in the DMIC and along the DMC, possess excellence road, rail and port connectivity. The PCPIR MRO facility can also double as an air cargo complex. Air cargo opportunity is discussed in the next section. It may be emphasised that the strategic intent should be to invite a large player/s in this segment immediately to take advantage of early entrance as numbers of players have planned to enter the MRO segment.